The project experiments with open-narrative structures, multiple archival figures, and focused play by developing enabling constraints. UNSW, Art & Design, Sydney, Australia. This essay discusses the first phase of Assemblage, a project that challenges conventional forms of documentation by experimenting with hybrid digital and spatial publishing platforms to productively archive refuse generated by artists participating in the Underbelly Arts Lab 2013. The project initiates an emerging archival system that uses a participatory lab-based approach to address new modes of documenting, curating, and configuring modes of engagement by activating incidental data generated during the lab event. This approach opens up possibilities for a productive exchange with the participatory artistic process, rather than a static record of its outcomes. 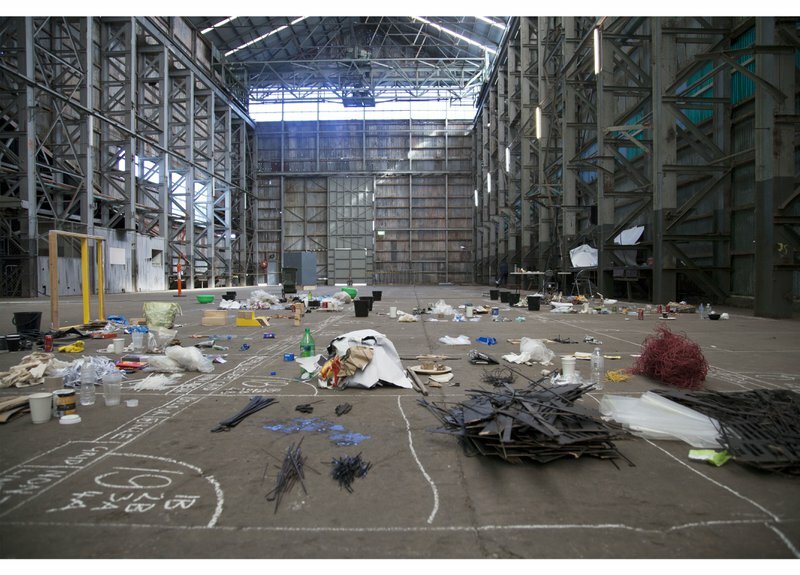 This essay outlines how the project experiments with open-narrative structures, multiple archival figures, and focused play by developing enabling constraints, called ‘The Rules of Assemblage.’ In practice, these rules function as an enactive index that both catalogs and assembles the discarded materials of artists participating in the laboratory. Assemblage is a project by Simone Mandl, in collaboration with Kate Campbell, Esther Chung, and Monica Monin. The project is framed within the broader context of the data-hoard, arguing that in order to address the problem of documentation culture, we must devise modes of material engagement that move beyond the passive record of process towards an iterative, productive archival exchange between artist, matter, and participant. The nature of the record has changed. From maps of our physical bodies generated by contemporary anthropometric data, to silos of big data and their records of our millisecond-to-millisecond behaviors, to our habitual status updates, we are, as a society and as individuals, compulsive data-hoarders, obsessed with documenting ourselves and with the record of our present-past. Jane Bennett notes that "perhaps hoarding is the madness appropriate to us, to a political economy devoted to consumption, planned obsolescence, planned extraction of natural resources and mountains of discarded waste." Precipitated by the cloud phenomenon, it is here, within the context of the surfeit of the archive, that the question of the resonance between documentary outcomes and the quality of empathic exchange between the artist, the audience, and the record should be addressed. Figure 1. View of Turbine Hall sorting bays, Assemblage I, Underbelly Arts Lab, Cockatoo Island, July 2013. Documentary Photograph. © Assemblage, 2013. Courtesy of Simone Mandl. 'I cannot think in chaos' has been the mantra of the artists on the island; their neat and organized practice is the antithesis of the artistic stereotype. Our site of production becomes the sorting ground for their detritus. Their refuse, discarded to return to precious order, has transferred a sense of never ending chaos in our collective…as if each discarded coffee cup is imbued with the anxiety of the project from which it came…The only respite in the day comes when 4 o’clock swings round and I can go make the daily collections, escaping the chaos for an hour or two, only to return with more of it. Simone Mandl, notes from the ferry wharf, waiting for the 9.05, Tuesday, Week 2. These notes were made in the second week of Assemblage, an active catalog project made in collaboration with Kate Campbell, Esther Chung, and Monica Monin that sought to explore productive archival methodologies enacted in the documentation of the Underbelly Arts Lab in July, 2013. Assemblage was devised as a productive model for the documentation, archiving, and regeneration of exchange between artists participating in experimental arts events. It addresses new modes of documenting and configuring forms of engagement by activating participating artists’ discarded material in a multi-phased, recursive framework that generates new project outcomes. The project experiments with open-narrative structures, multiple archival figures, and focused play by developing a unique, enactive index, called "the Rules of Assemblage," to catalogue the discarded materials of artists participating in the festival. 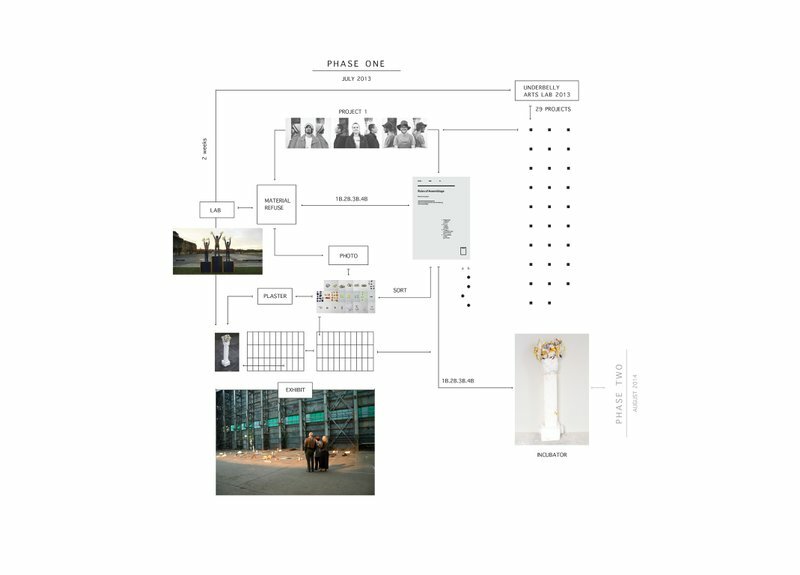 The notes describe the experience of processes set in motion by the procedural installation that established a series of rituals, enabling constraints and modes of documentation, generating a productive archive of the festival (see fig. 2). 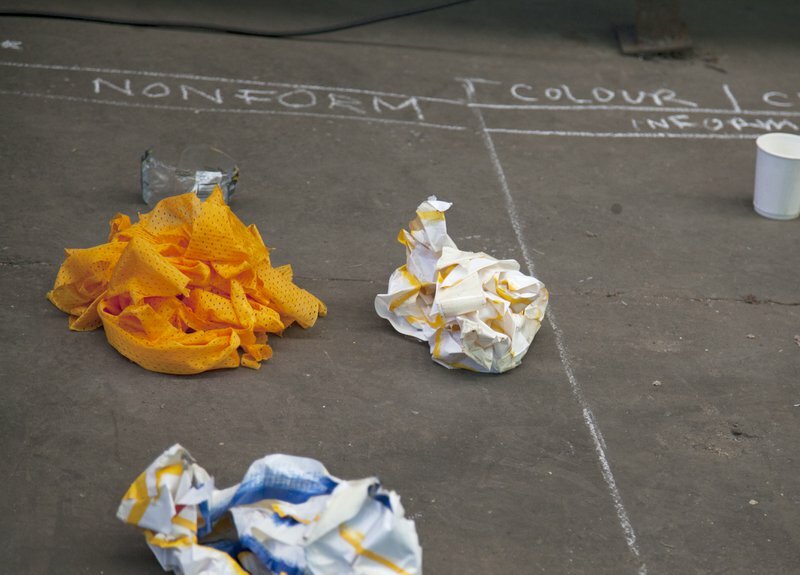 At the opening of the lab period, each artist was given a laundry bag to fill with their discarded matter and were asked to fill out the "The Rules of Assemblage" questionnaire. For seven days, usually at four o’clock, members of Assemblage would visit the artists on-site to make their collections. The bags would then be emptied in a mass sorting bay and returned to the artist, ready for the next day's refuse collection. 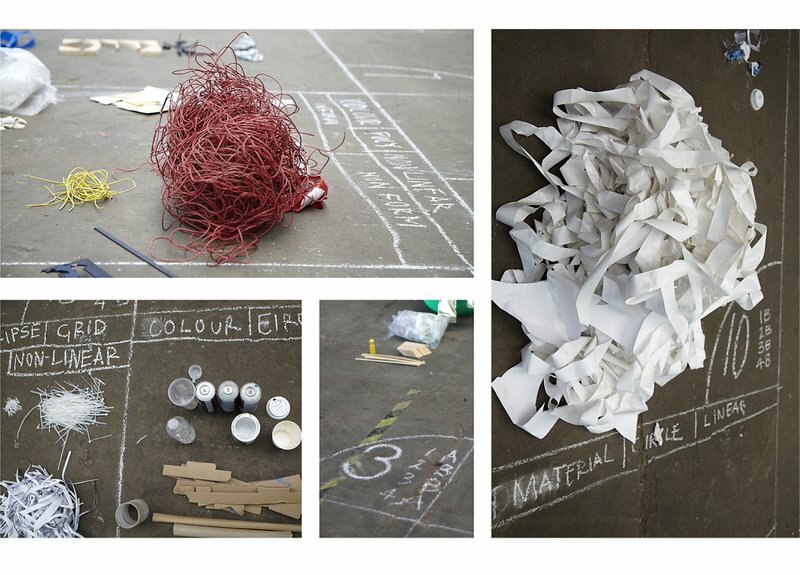 In the interim, we would sort and document the artists’ discarded materials according to their rules of assemblage. This ritual of visiting the artists each day, of catching up on the day’s events—the material breakthroughs and disasters, the complacency and the anxiety—coupled with the intimacy with the artists' discarded materials afforded by the sorting process came not only to bind the microcosm of the lab experience together, but also to reflect the need for such a method in the first place. For it is precisely the complexity of these relations in flux that is overlooked by traditional forms of documentation of such events. Figure 2. Assemblage: phase 01 production flow. Illustration by Simone Mandl. © Assemblage, 2013. Courtesy of the artist. Figure 3. 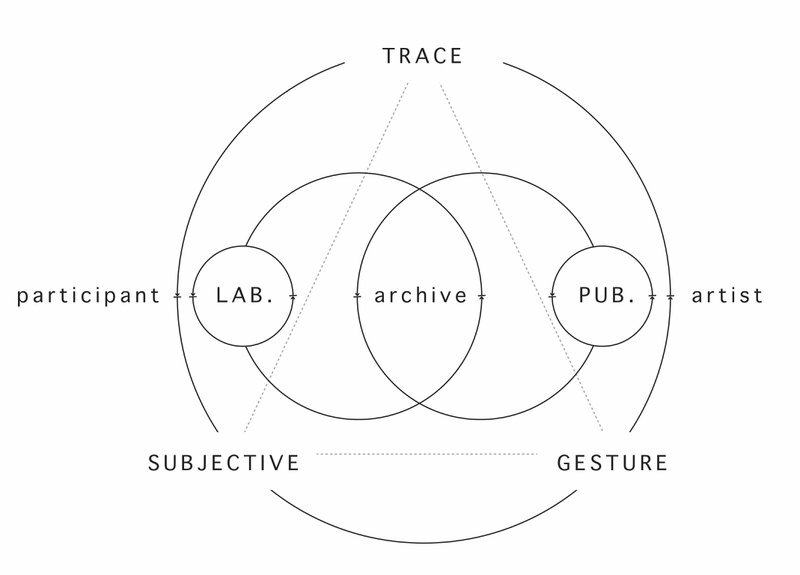 The Productive Archive: practice schema. Illustration by Simone Mandl. © Simone Mandl, 2013. Courtesy of the artist. Assemblage sits within a broader body of research that experiments with hybrid digital and spatial publishing platforms (figure 2), which develop productive methods of "articulating a sense of the world as an unformed but generative flux of forces and relations that work to produce particular realities." Specifically, the Assemblageproject seeks to develop methods of documentation that are in line with the conceptual objectives of the Underbelly Lab itself: the active subject, open narrative, community engagement, and collaborative practice. In action, this first phase of the project was realized by initiating an emerging system within a participatory-lab based methodology. This framework sees the incidental, trace material or data discarded by the artist's practice recorded and regenerated in a recursive process in order to create new project outcomes. As such, Assemblage looks at what narratives of form can be drawn by activating the hinterland of the event. 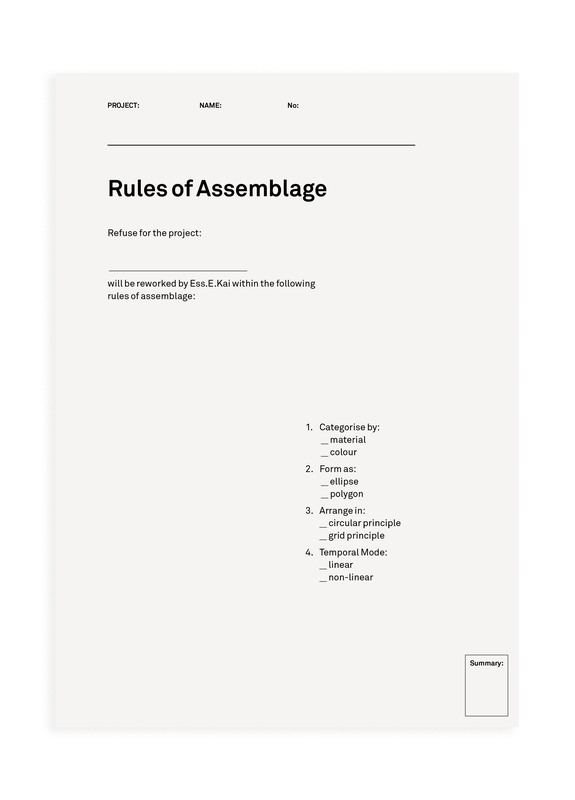 The enactive system itself, designed to sort, document, and assemble the refuse material collected from each project, was a four-part questionnaire titled "The Rules of Assemblage" (figure 4). The questionnaire generated unique codes based on the artists’ answers, thereby setting the enabling constraints for the cataloguing of each project. Figure 4. ‘Rules of Assemblage’ questionnaire. Assemblage I, Underbelly Arts Lab, Cockatoo Island, July 2013. © Assemblage. Courtesy of Simone Mandl. A series of relations for mapping the material exchange of artists participating in the Underbelly Arts Lab, 2013. A collaborative process between Assemblage and the 29 participating artists. Due to the intensive nature of projects typically taking part in lab-based events, it was necessary that we initiated a means of collaboration that would require a very small level of input on the part of participating projects. A set of aesthetic parameters that could be applied to the archive of each project throughout the recursive phases of the research. In installation, this four-part questionnaire generated a unique code or index for processing refuse. As seen in figure 5, the photos illustrate that the index was inscribed with point-of-use instructions for each stage of documentation; in practice, this same code came to govern and occupy the project as it moved through collection, categorization, assemblage, and final installation. Figure 5. ‘Rules of Assemblage’ index inscribed as point-of-use instructions for sorting the artists’ refuse during the installation. Assemblage I, Underbelly Arts Lab, Cockatoo Island, July 2013. Documentary Photograph. © Assemblage, 2013. Courtesy of Simone Mandl. By collecting, cataloging, and actively engaging with the material refuse of a project, rather than with its final output, we are able to generate a material record that documents the development of the project itself by assembling the physical traces left by the material, immaterial, and human agencies at play in the project’s development. As the lab progressed, the artists’ intentions toward and engagement with the project slowly emerged in their curation of the material we collected each day. Their methodologies were evident in the order and disorder with which they packaged their refuse, as well as the choices they made about which items to discard: sawdust swept and separated into wet and dry bags; half-eaten fish and chips; an empty box of muesli bars with only one wrapper; endless streams of tape and coffee cups. In action, the daily collections meant that we were in a constant state of sorting and re-sorting the artists’ refuse. Somewhat inevitably, we began to associate the refuse collecting in the turbine hall with the artist collectives they had come from. 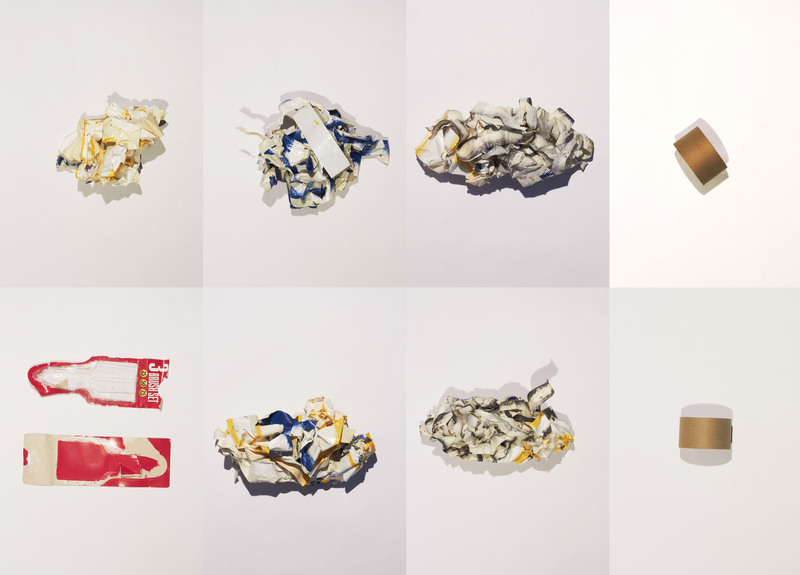 To our surprise and delight, the process of sorting and re-sorting the refuse according to the index of each project produced assemblages that appeared to embody the projects themselves. Figure 6. Assemblage I, Underbelly Arts Lab, Cockatoo Island, July 2013. Refuse collected from project one (110%), day three. Documentary Photograph. © Assemblage, 2013. Courtesy of Simone Mandl. Figure 7. Project one rehearsing. 110%, Underbelly Arts Lab, Cockatoo Island, July 2013. Documentary Photograph. Photograph by Misha Turovskii. © 110% 2013. Used with permission. In effect, the refuse came to speak not only of the material assemblage of a given artist's project, but also of the process of its creation. For example, in the mass of matted and discarded masking tape collected on day three from Project One (figure 6), edged in shades of blue, gold, and grey, we learned that on that particular day, the collective painted straight lines in three colors. At the point of collection and cataloguing, there was no indication of what it was they had painted or why they had chosen those colors, but their collective action is present in that day's record. Later, as I watched them rehearse in their grey one-piece suits, accented by blue and gold triangles, I saw that they were each standing on an award podium striped in blue, grey, and gold (figure 7). Here, the tape embodied the material exchange between the performance artists and their stage, between their idea and its fruition; it was the material that bound the idea and its creation, the line between the object and the narrative it embodied. 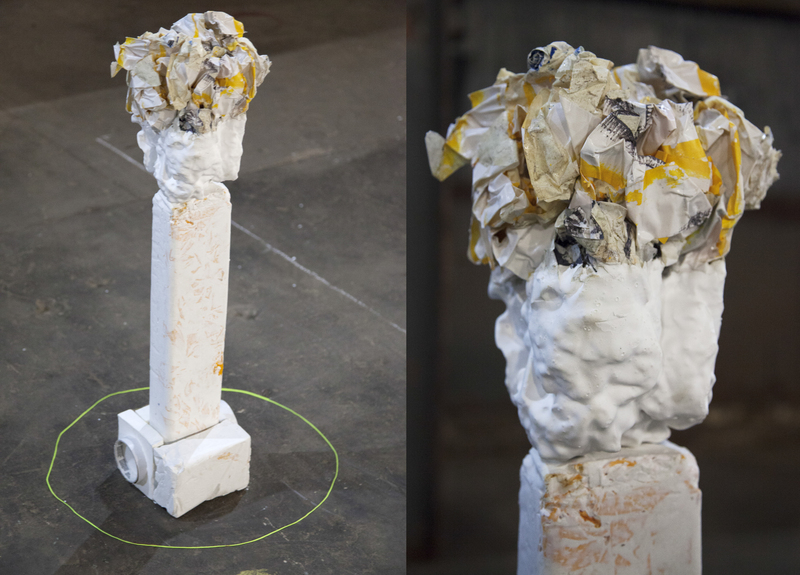 Later, during the assemblage of their project’s refuse into a sculptural artefact, this tape surprised us in its similarity to the tallest member of their collective, emerging as the bust of their sculptural relic. Alluding to Olympians on their podiums, the matted masking tape had come to embody the athletic quality of the artists’ durational performance, as well as its symbolic end. The stage of the project, in which each project's refuse was assembled into a new material form, was in a constant state of flux throughout the lab. Throughout this stage, we were forced to dramatically shift the method and material outcome of the project as we struggled to reconcile our intended course with the overwhelming vitality of the material we had collected. 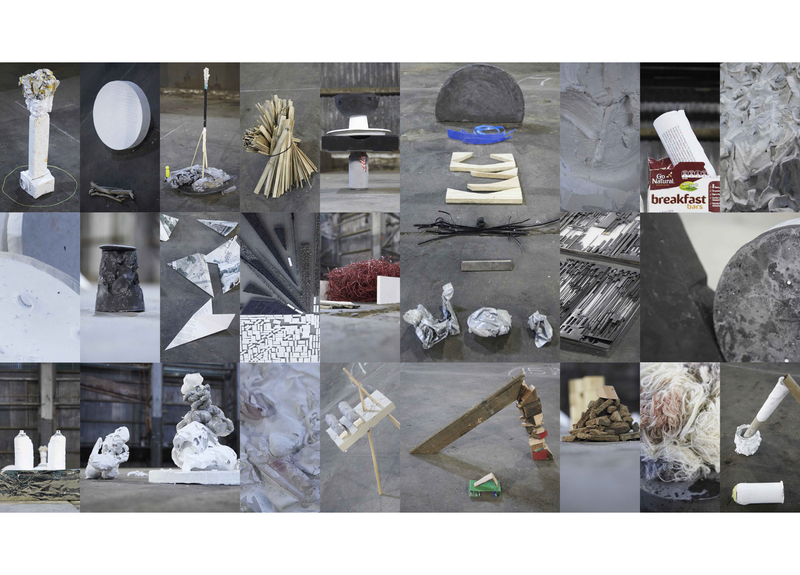 Our original intention had been to process all the sorted refuse through an industrial shredder, reassembling the material in new forms within the enabling constraints determined by the artists’ ‘Rules of Assemblage’ responses. Our plan was to bind the shredded material using minimal amounts of plaster and to then cut through these combined forms to reveal the sedimentary layers representing the material experience of the project. The idea was that each project’s "artefact" would act as a kind of sculptural visualization of their process. This plan was thwarted when the shredder refused to turn on. We experimented with cutting the material by hand. Then we experimented with layering the refuse intact. But we soon realized that the extremely humid and dark conditions within the turbine hall meant that the plaster would never dry enough to cut. Our response was to maniacally order and reorder the material, and to return to the bureaucracy as we considered other material responses to the project. Throughout this apparently unending chaos, the artefacts themselves, as they gathered in their designated grids, waiting for their fate to be determined, began to embody both the work and the character of the project from which they had been discarded. Somehow, as we endlessly ordered and reordered the materials from each project, the artefacts had begun to assemble themselves as totems to their origin. Figure 8. Project one refuse: catalogued and categorized in sorting bay. Assemblage I, Underbelly Arts Lab, Cockatoo Island, July 2013. Documentary photograph. © Assemblage, 2013. Courtesy of Simone Mandl. Figure 9. Project one, exhibited artifact. Assemblage I, Underbelly Arts Lab, Cockatoo Island, July 2013. Documentary photograph. © Assemblage, 2013. Courtesy of Simone Mandl. Figure 10. All assembled artifacts. Assemblage I, Underbelly Arts Lab, Cockatoo Island, July 2013. Documentary photographs. © Assemblage, 2013. Courtesy of Simone Mandl. In our struggle, it could be argued that despite our intention to empower the discarded, invisible, and incidental material of a project, the true intention of the work was to express human agency over the artists' refuse. However, the outcome was much more horizontal than expected, in that the final assemblages were as much responses to the overwhelming vitality of the material we collected as they were a kind of refusal to comply with the structures and systems we had designed to process them. In the end, we sat with each collection and silently assembled each artifact. Nothing was destroyed. Things were entombed, enshrined, encased, and enveloped, but never destroyed. These were not the assemblages we set out to create (figure 10), yet in the transformative process we had constructed, they were somehow truer to the experience of the material, the artists, and ourselves than our intended creations would ever have been. In closing, let us revisit the question: what constitutes the surfeit of material produced by an experimental arts lab? The short answer is many things: It is masking tape, discount-ready meals, screws, dust, wind, sweat, tears, exhaustion, elation, caffeine, cigarettes, cola, whiskey, paper, emails, conferences, consultations, making and breaking plans, plastic, hot chips, chocolate, muesli wrappers, sawdust, wire, and talk. What Assemblage argues is that by collecting, cataloging, and actively engaging with a project's material byproducts (the incidental data generated by the creation of a project), rather than looking to its final output alone, we are able to generate a material record that captures the narrative development of the event itself; a recursive self-assembling of the material traces discarded by the material, immaterial, and human agencies at play within a project’s development. Jane Bennett, “Powers of the Hoard: Artistry and Agency in a World of Vibrant Matter,” (Lecture, the Vera List Center for Art and Politics, The New School, 2011). This can be viewed at http://www.veralistcenter.org/engage/event/235/jane-bennett-powers-of-the-hoard-artistry-and-agency-in-a-world-of-vibrant-matter/(accessed March 12, 2015). Claire Bishop, Artificial Hells: Participatory Art and the Politics of Spectatorship (London and New York: Verso Books, 2012), 5. 3] John Law, After Method: Mess in Social Science Research (London and New York: Routledge, 2004), 21. Law describes the hinterland as "a concrete metaphor for absence and presence," as a bundle of relations that "enacts a topography of reality possibilities, impossibilities, and probabilities." The processes of enactment within Law's hinterland is "method assemblage": "generally, the process of crafting and enacting the necessary boundaries between presence, manifest absence and Otherness." Ibid., 160. Simone Mandl is a Sydney-based, multidisciplinary designer working across media in the arts, architecture, and fashion. She is the co-creative director and founder of the arts collective I Can Draw You A Picture. 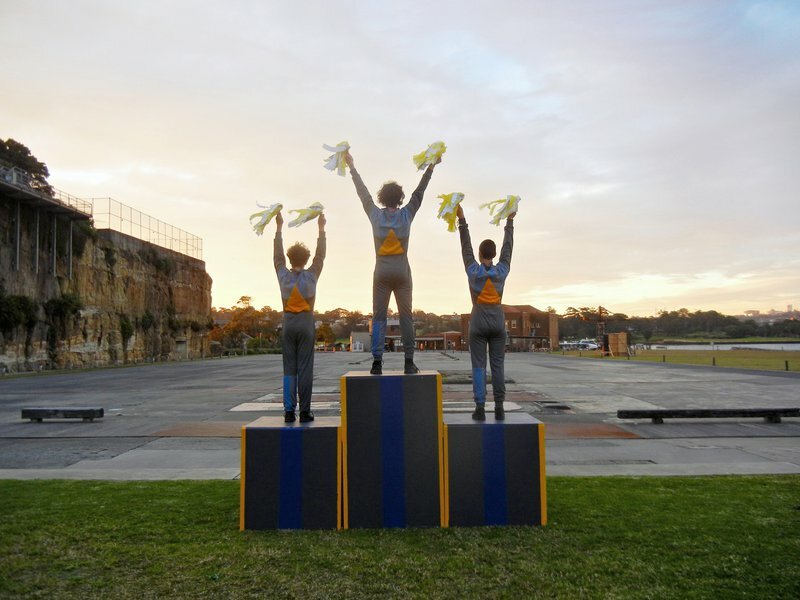 Past projects in participatory art, experimental publication, installation, and commercial design have included collaborations with Ampersand Magazine; Campbelltown Arts Centre; Sydney Opera House; Serial Space; Performance Space; Reeldance; ABC Radio National; Romance Was Born; The Paper Mill; Underbelly Arts; and the School of Design, UTS. She has exhibited personal work at Chalkhorse Gallery, Firstdraft, Performance Space, Underbelly Arts, and 107 Projects, as well as curatorial work at Firstdraft, 107 Projects, and the Paper Mill. Petra Gemeinboeck is senior lecturer and deputy director of the NIEA Creative Robotics Lab at UNSW | Art & Design. In her experimental art practice, Petra explores the complicities and vulnerabilities in our relationships with machines, and is interested in making tangible the desires and politics involved. Petra was a finalist for the National New Media Art Award 2012, Gallery of Modern Art, Brisbane, AU. Her works have been exhibited internationally, including at the Ars Electronica Festival, Linz, AT; International Triennial of New Media Art at NAMOC, Beijing; Centre des Arts Enghien at Paris; Foundation for Art and Creative Technology (FACT), Liverpool, UK; Gallery of Modern Art, Brisbane; ICC Tokyo; and MCA Chicago. She has published widely on issues of interactivity and machine agency.